Dry standpipes are an economical method to provide water supplies to areas which fire engines cannot access. 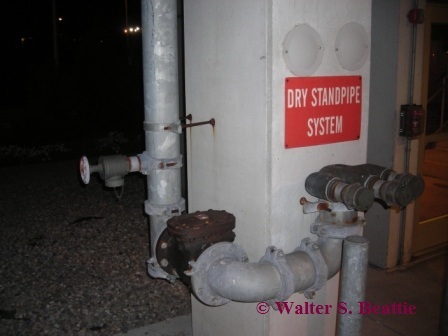 This Dry Standpipe is located at the parking garage of an airport. A fire engine will pump water into the inlet fittings. The swing-clapper type check valve allows the water to enter into the piping and prevents it from draining out when the hoses are removed. A low point drain prevents water from standing in the pipes and freezing in the winter. Fire departments should have a written operating procedures for using these systems. This entry was posted on Sunday, April 17th, 2011 at 10:22 pm and is filed under Uncategorized. You can follow any responses to this entry through the RSS 2.0 feed. You can leave a response, or trackback from your own site.